Yamaha dominates the world of digital pianos. Although there are other excellent brands such as Roland, Casio etc. it seems that the empire of Yamaha is unbeatable. Musicians all over the world prefer to play and perform with the Yamaha outstanding instruments. Reputation - The Yamaha company produces musical instruments for over than 100 years. They were always pioneers in their field and will probably continue in this spirit in the coming years. Yamaha digital pianos are durable, they don't break down easily. (I have an old Yamaha keyboard which still works after 25 years!). Touch - The Yamaha piano engineers have developed keyboards that react similarly to acoustic pianos. Yamaha has a special patent - the Graded Hammer Action: it means that the keys are gradually heavier top to bottom, and by that you gain the same touch as a real piano. Sound - Yamaha has labs in which engineers sample the sounds of acoustic pianos and apply them into their digital pianos. Yamaha produces acoustic pianos - One of the reasons that Yamaha is such a good brand in digital pianos is that they are one of the rare manufacturers that produce both acoustic and digital pianos. Their piano engineers know how a real piano should sound, and how a real piano keyboard should feel. Yamaha has so many models of digital pianos. How do you choose the one that will fit you? Touch and feel - I advise you to try various instruments in order to feel the keyboard and find the one that you prefer. Try playing on acoustic pianos as well in order to compare between real pianos and digital ones. Play and listen - Play and listen to various digital pianos. Choose the one with the most beautiful sound. Need a Portable Keyboard? Need a portable keyboard? Are you working as a musician? are you often jamming with friends? Well in this case you should probably look for a handy and portable keyboard. Bottom line? I own a motief 8x (Yeah, the one you can see in my piano tutorials) by Yamaha and while trying to take it to a gig it didn't even fit in my CAR :)! Other features - Does it have a USB connection? Does it have a convenient display screen? Sounds bank? Pitch bend? Etc. There are many features in digital pianos. Some of them may be crucial for your needs and some of them may be unnecessary. Don't waste your money on features that you will probably never use. Price - After you have verified your exact needs you can check the prices of the various digital pianos. If you're looking for a good bargain here is a great store with low prices and a good service. Reviews - Read reviews of people who bought one of the models which you are interested in. It is always good to hear different opinions. 88-key hammer-action keyboard. 64-note polyphony. AWM stereo-sampled grand piano sound. 30 sampling banks. 6 voices. 2 - 6W amplifiers. 2 - 4-3/4" speakers. Walnut cabinet finish. Sliding key cover. Reverb and chorus. 11,000-note song recording capacity. 3 pedals. Metronome. MIDI in/out. 2 headphone jacks. 6 voice demo songs. 50 preset piano songs with included sheet music. 82 lbs.. 53-5/8" W x 32-1/4"H x 16-5/8"D. Bench included. 88 graded-hammer keys for real acoustic piano feel. Stereo-sampling Advanced Wave Memory ( AWM) tone generation for 14 superb instrument voices. PC interface plus MIDI in/out/thru. Digital reverb, chorus, and brilliance effects. Dual-voice mode. 2-track song recorder. Built-in speakers with 2 - 20W amplifiers. 64-note polyphony. Beautiful woodgrain cabinet with dark rosewood finish and sliding key cover. Built-in power supply. Includes bench. An 88-key digital piano with a graded-hammer keyboard and bench that's ideal for beginning students and experienced players alike. Slim Cabinet Design. Graded Hammer Standard (GHS) keyboard. Advanced Wave Memory (AWM) Stereo Sampling. Three pedals for expressive control. Built-in library of 50 piano songs. The 88-key YDP-S31 ARIUS series console piano has 64-note polyphony, 6 voices, 4 types of reverb, a metronome, 1-track recording/playback, MIDI I/O, 2 x 1/4" stereo phone jacks, a matching silver pedal (Damper with half pedal effect, sostenuto, and soft). It's dark alder finish cabinet has a folding cover to protect the keys. Music rest and song book included. As the newest member of Yamaha's P series line, the P-140 delivers incredible sound performance at an incredibly sound price. Featuring Yamaha's highly acclaimed Graded Hammer Effect keyboard as well as realistic piano and instrumental voices, the P-140 offers both the authentic feel of an acoustic piano and the advanced features of today's digitals. Whether you are an accomplished or a spiring musician, the P-140 has the simple operation and superior style you need to showcase your abilities. Yamaha handpicked a CFIIIS 9' concert grand painstakingly tuned by a master piano technician, and captured every aspect of its sound, including felt dampers resting on strings. To provide realistic expression, there are 4 samples per note, so that playing softer or louder triggers separate samples at different levels. A Graded Hammer keyboard enables ultra expressive performances and feel. Equipped with 88 keys, 17 voices, 50 preset songs, built-in speakers, MIDI I/O, and USB, Includes sustain pedal and power adapter. Drawing on a rich tradition and experience, the 88-key Yamaha CP-300 keyboard gives the live performer all the sound and expressiveness of a superbly mic'd grand piano with the portability and versatility of a modern digital piano. 88 weighted, graded-hammer action keys and 3-layer Dynamic Stereo Sampling with samples for key-off, sustain pedal, and string resonance. 28 voices; effects; 64-voice polyphony; 48-character LCD screen; 2 zones with dual and split modes; MIDI I/O; pitch bend and modulation wheels, USB connection; and metronome. Foot pedal included. 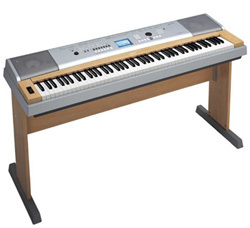 A 76-key, portable digital keyboard with piano-style keys, wood paneling, USB connectivity, and a lesson mode for beginners. 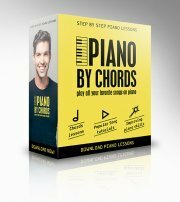 A 76-key, portable digital keyboard with piano-style keys, USB connectivity, and a lesson mode for beginners.